Cherry Cheva (full name: Cherry Chevapravatdumrong) is originally from Ann Arbor, Michigan. She is the author of two novels, She’s So Money and DupliKate, and she also co-authored, with Alex Borstein, It Takes a Village Idiot, and I Married One. Cherry currently serves as a writer/producer on Family Guy. She lives in Los Angeles. By the time Kate Larson accidentally fell asleep at three a.m., she'd already done more work in one night than the average high school senior does in a week. Getting into Yale has been her dream for years—and being generally overworked and totally under-rested is the price of admission. But when she opens her eyes the next day, she comes face-to-face with, well, her face—which is attached to her body, which is standing across the room. Wait, what? 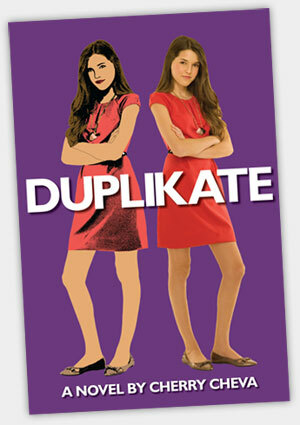 Meet Kate's computer-generated twin. Kate doesn't know why she's here or how to put her back where she belongs, but she's real. And she's the last thing Kate has time to deal with right now. Unless. . .
Could having a double be the answer to Kate's prayers? After all, two Kates can do more work than one. Or will keeping her twin a secret turn her dream future into a living nightmare? Question: What do you get when you take . . .
1 overachieving girl + 1 insanely cute guy + 1 massive fine + 1 scheme involving a little dishonesty and a whole lot of cash? I've always been the good girl—working seriously long hours at my family's restaurant and getting straight As. And Camden King was always just that hot, popular guy I'd pass in the halls, whose ego was probably much bigger than his brain. I didn't think there'd ever be a reason for us to actually, like, interact. Then again, I never thought I'd mess up so badly that my family might lose our entire restaurant if I didn't come up with a ton of money, and fast. So that's where Camden comes in—he and his evil/genius plan to do kids' homework for cash. I know cheating's wrong, but it's better than being dead, right? Which is what I'd be if my parents knew about what happened. I never expected things to spin so far out of control. Or that I'd be such a sucker for Camden's lopsided grin. Or that falling apart could be the best thing that ever happened to me. Answer: The time of my life.